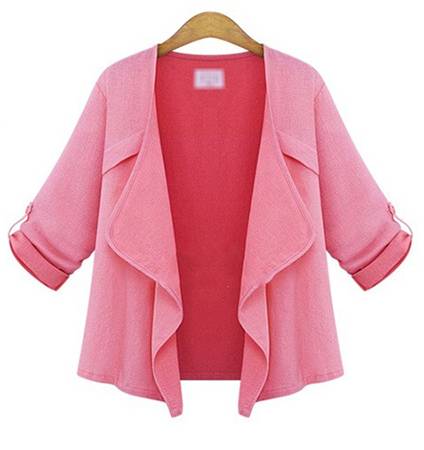 You will love this adorable swing style jacket. This style is trending across the world right now, and is one of our most popular styles. It comes in three color choices. Select your favorite from a sweet pink, aqua blue or basic white. The jacket is cut wide through the body, providing a full, comfortable wear. It has three quarter length sleeves that are secured at the elbows with attached Epilates. The wide lapels cover the front of the bodice and flow gracefully to the hemline. This jacket is machine washable in warm water and may be tumbled dry on low heat. It is available for purchase in sizes Small, Medium, Large and Extra Large.